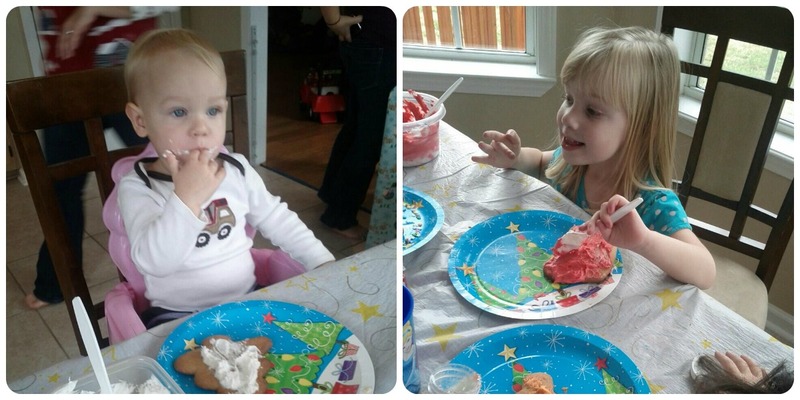 Yesterday we got invited over to K's house for a Christmas cookie decorating play date. K is Sarah's best friend from the Y so she was thrilled to death to go over there and play with her and her extensive dress up collection. It wasn't long before they were both dancing around the house in princess dresses. 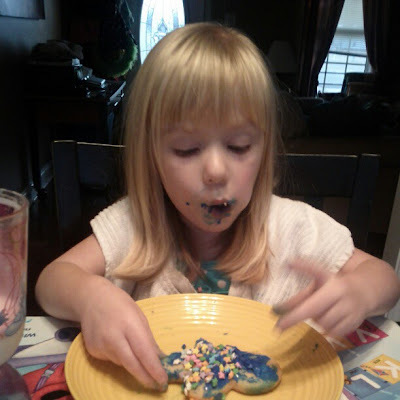 After a little bit of herding we got the kids into the kitchen to decorate some delicious cookies K's mommy baked. Sarah enjoyed smearing the frosting around on the cookies and then dumping half a bottle of sprinkles on each one. While I was helping Sarah one of the other mom's gave Cody a cookie with a little blob of frosting on it. After a quick taste test he spent the rest of the time licking the frosting off the cookie. He was pretty happy. It was not one of my finest days of nutrition for the kids. They had snacks and their cookies for lunch at the play date and came home and shockingly still took good naps. But after the naps there I was with a plate of cookies still in the house. I decided, probably against my better judgement, to get them out of the house in one day rather than let them linger and spread the sugar out. So for their post nap snack I gave them bibs and a cookie and let them go to town. A little bit after we finished our snack I noticed that everywhere there had been blue frosting on her face had broken out in hives. I checked the frosting label for egg whites but didn't see it so we're not quite sure what the reaction was to but she survived. Cody thought this was the best day and snack ever. Look at that smile! He was absolutely giddy and just giggled to himself a few times while he was eating his cookie and finger painting with the frosting. I think he understood this was a very rare occasion and he was going to live it up. We've got decorating Christmas cookies on our 12 days of Christmas we're starting next week so we'll get to do this activity one more time. I think I'll make cream cheese frosting instead of butter cream just in case for Sarah. Plus, I like cream cheese frosting better on my sugar cookies. Yum! Yum! 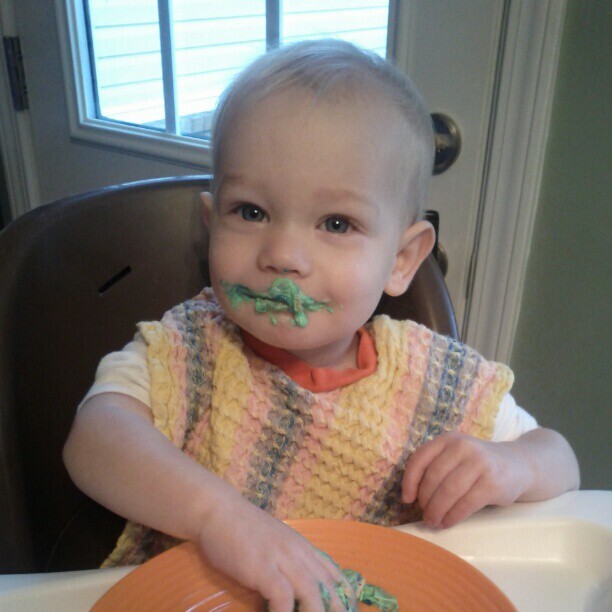 And, I love those dish towel bibs. Do you make them? ?